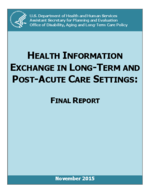 This report provides an overview of current efforts for implementing electronic health information exchange (eHIE) by long-term and post-acute care (LTPAC) providers. The report describes the extent to which LTPAC providers are preparing for and implementing eHIE with their partners and assessing its impact. The report provides a review of the grey and published literature from the past 3 years and findings from discussions with 22 stakeholders representing 12 regions where eHIE initiatives involving LTPAC providers are completed or ongoing. The report also presents findings of in-depth case studies of three eHIE initiatives in which LTPAC providers participate (1 in Pennsylvania and 2 in Minnesota).